The Snow Queen: Magic of the Ice Mirror! Orm is back! When we last left Orm and the crew they had just defeated the Ice Queen. Orm had returned home and unfroze the village. But now it’s a year later. Orn has not told anyone of his involvement with the Ice Queen, he’s tried to live a normal life. But it’s been difficult. Even thought he tries he finds himself constantly lying, about everything. Big and little lies. There’s not much Orm tells the truth about. He hides they are in danger of losing the cottage from his Grams. He lies to his coworkers. There is not much he tells the truth about. Instead of telling Grams the truth about the cottage and not paying the mortgage Orm decides to enter the tournament to win the hand of the Princess. If he wins her hand then Grams and him will move into the castle and losing the cottage won’t be a big deal. But to win her hand Orm must tell numerous lies. Lies ontop of lies. He takes credit for killing the Snow Queen and leaves out the friend that helped him. He leaves out that he had been working for her. He makes himself out to be a hero. The King believes him and give Orm his neieces hand in marriage. Out of nowhere the North Wind comes through the village and takes the Princess. Now it is up to Orm to rescue her. But even on his way to rescue her Orm is still lying. Everyone thinks teh Snow Queen has returned but really it’s Orm’s lies that have caused the return. Orm’s lies has created a Snow King in his image. Now it’s up to Orm to defeat him and dethaw the village once more. Can he do it? You’ll have to watch to find out. Here’s a little teaser to peak your interest. 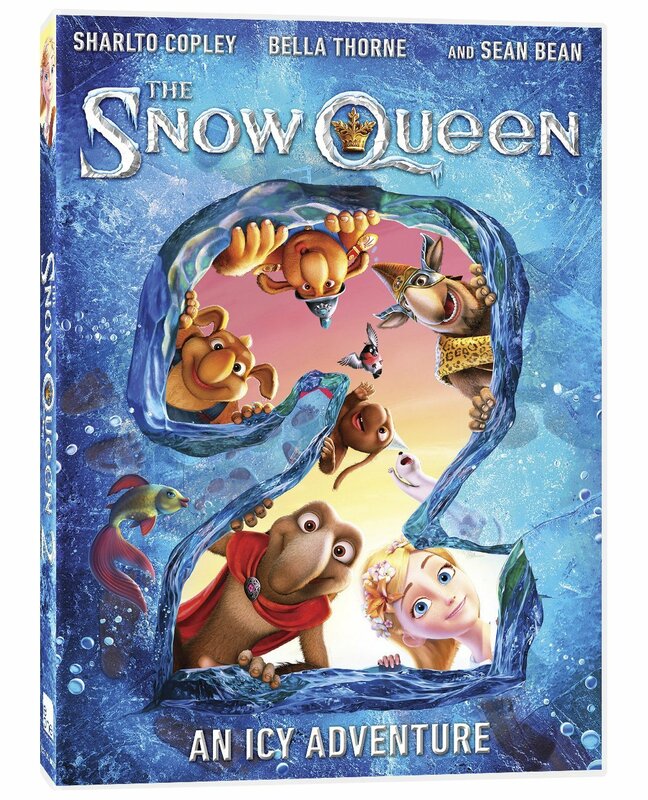 The Snow Queen:Magic of the Ice Mirror comes out on DVD November 3rd. But you can enter to win a digital copy here. If you liked the first Snow Queen you are going to love the second. It’s full of some familiar characters like Gerda and Kai. A digital copy of The Snow Queen: Magic of the Ice Mirror was provided for review purposes. All thoughts and opinions expressed are 100% my own and not influenced by another party. Peyton’s Penny Pinching Momma is not responsible for prize fulfillment. The winner will be sent a digital code by the sponsor.